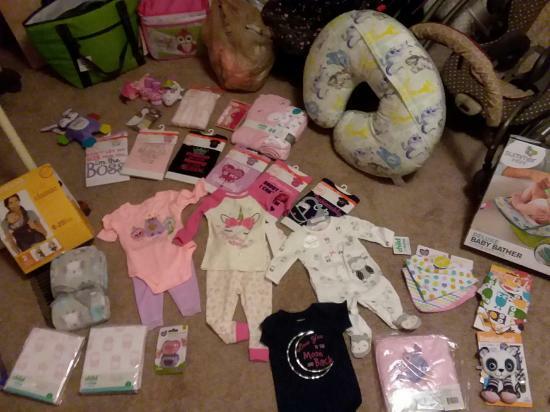 These are all of scarlettes gifts from the baby shower !! — Yes she is, spoiled, she got 4 more gifts yesterday and 2 more coming through the mail. Her room is almost completely full. — Awwww. 😍 Maggie has those unicorn pj’s too. ☺️ and you’re going to love that baby carrier if Scarlette is half as clingy as mine is! I use mine every day. — Yay. We got cards mostly and I ordered some things but we already mostly has the big stuff. — Yess I have the rest coming this week! The bottles and stuff. If anything we have to wait to see what else she needs. Not sure how she’s going to want to sleep and where. — I need more bottles also ! And diapers! My daughter will be in a bassinet by my bed, then a crib after a few months, when I feel ready ! I'm not going to want to take my eyes off of her in the newborn stage.. being a mom is exhausting but worth it !